The pro-pot community has been trying hard to get the Federal government to decriminalize weed in this country. While some folks use weed recreationally, there are some ill folks who need medical cannabis products to reduce their pain and live more comfortably day by day. If you happen to be a medical-cannabis user, you may be interested in figuring out what it is that you are taking. Frweed Pro is just the app for that. Frweed Pro covers over 200 strains available. You can search through the database in this app by name, color, type, and symptoms. This tool covers type, flowering time, origin, medicinal use, and effects for each strain. It also shows you how much you need to take for your condition. 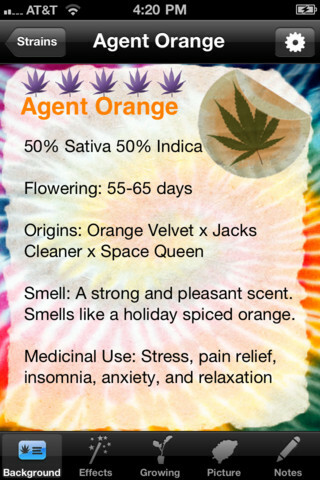 Frweed Pro is especially useful for those who have picked up a new strain and want to find out more about it. Frweed Pro has 12 themes you can choose to customize your experience. It can handle your personal notes and ratings too. Pretty handy tool for anyone who consumes cannabis medicinally.